Florida A&M University’s president reached an agreement with school officials to immediately resign July 11, after facing months of criticism in the hazing death of a marching band member. Last week, James Ammons had submitted a letter stating his resignation would not take effect until Oct. 11. However, he waived a provision allowing him to give 90 days notice to the FAMU board in exchange for getting paid bonuses. Ammons will be paid more than $98,000 in performance bonuses from his last two years in office — and will still earn his full presidential salary of more than $341,000 over the next year while he remains on sabbatical. Ammons plans eventually to return to FAMU as a member of the faculty. The school’s governing board — which held an emergency conference call to discuss Ammons’ resignation — voted in favor of the deal and named FAMU Provost Larry Robinson as interim president. The death of 26-year-old Robert Champion unraveled the hazing culture at the university, specifically within the famed Marching 100 band. Trustees have complained about a lack of oversight of the band as well as lax management on other issues at the university. Eleven FAMU band members face felony hazing charges, while two others face misdemeanor counts for their alleged roles in Champion’s hazing. They have pleaded not guilty. Meanwhile, Champion’s family has sued the university. Interim president Robinson had previously served President Barack Obama’s administration as assistant secretary of commerce for oceans and atmosphere at the National Oceanic and Atmospheric Administration. 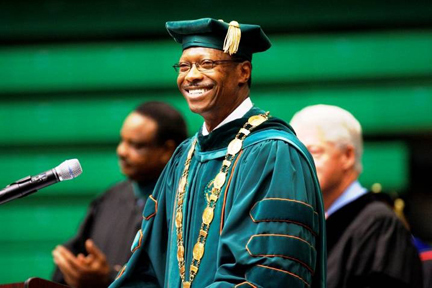 He also briefly served as the top official in charge of FAMU back in 2000, before Ammons was appointed president. FAMU's board spent more than an hour discussing whether to make Robinson interim president so quickly. Questions remain about whether other candidates should be considered — and whether an interim president is eligible to apply for the job permanently. But both the student body president and head of FAMU's faculty senate pressed to appoint Robinson immediately to bring stability to a campus that has been reeling since Champion’s November death. “I know how jittery the university community is at this time,” Narayan Persaud, a FAMU professor, told other board members. Still, in order to reach consensus, trustees agreed to take a more formal vote when they meet again in August. The choice of interim president will also have to be approved by the Florida Board of Governors, the panel that oversees the entire state university system. “There is work to be done and I stand ready to do my absolute best to keep FAMU on its path of success,” Robinson added. Ammons had vowed a month ago to remain at his job, despite a no-confidence vote from trustees in June. During the recent conference call, Ammons agreed to step down immediately but did not comment further about his decision. Ammons was first brought on five years ago to help stabilize the school's financial troubles and threats to its accreditation. Other problems have come out in the past year. A top auditor resigned after it was discovered false audit summaries had been distributed. It was revealed that more than 100 members of the Marching 100 weren’t students. And there is an ongoing state criminal investigation into band finances. Additionally, the athletic department has a multi-million dollar deficit, and it appears that enrollment will drop this fall. Ammons had already launched initiatives to battle hazing, including strict new requirements for membership in the Marching 100. It could take as long as a year to find a new president, but FAMU board members said Robinson will need to help deal with the damage now. “I just believe there is some major cleaning up that needs to be done in the interim,” said Torey Alston, a FAMU board member.